I had the opportunity to co-lead the art focused Creative Playshop at “The Body Now” Summer Retreat with Turning the Wheel this past week. It was a treat to guide our intimate class through the stages of creating a beautiful mixed media sculpture. The theme this year was “Living our Joy” and after much deliberating me and my creative partner, Dodi, settled on creating nests this year. Nests are such a powerful image of growth and home. They encapsulate so many aspects of a healthy life. Manifesting, nurturing, protecting, growing, snuggling, nesting. Dodi and I steered our lovely group of participants into new relationships with the materials and their own inner artist. My personal agenda for the Creative Play session was to spark a new way of relating to art in the individuals. We played with the materials beyond the visual realm, relating to the way they felt, the way they resonated, the way they brought us joy. At the end of the week each person had a perfect little capsule of the joy from the class filled with intention and beauty. I’m always shocked at the buoyant creativity each person brings to the table. Each nest was a unique expression of the creator. I modeled the steps each day by creating my own nests. We had two options for creating. One started with a decoupage bowl base, and the second started with a paper bag. I ended up creating two, while everyone else dove deeply into one creation, which lead to a wonderful depth in the sculptures. That being said I’m still very happy with my two little treasure nests. We ended the week with a showcase at the closing celebration. Watch the Video Here. Huge shoutout to Dodi for being the best mentor and partner in guiding this class. Love you! My two nests side by side. The top is made from a paper bag and the bottom is decoupage. Each magical addition added to the story and the joyful power. On day three we shared our joy with each other by creating tokens for another persons nest. I cherish my token from Suzanne! Sad to miss out? You can sign up for next years camp right now! Check it out. For the past several years I have attended “The Body Now” Summer Retreat as a lead facilitator for Turning the Wheel. It has become a time for me grow in my leadership skills and to rest into my self so that I can step back into the world bright and inspired. This year was no different and the I feel filled to the brim with joyous energy. I’m ready world. Watch out! As part of the week of moving, playing, learning, breathing, connecting, and dancing we all have the opportunity to express ourselves through art. This years art project was to create a journal and the supplies and options were simply abundant. Each day I made several art pages that captured glimpses from the meditations and learnings of the week. My journal was quite expansive by the end. I wanted to share with you a few of my favorite pages from the week. This page continued to evolve throughout the week. I had the blissful opportunity to work on this while others were singing and dancing nearby. It was lovely. A bag of tricks to keep me going forward. Stamping feathers might be my new favorite thing. Sad you missed it? You can sign up for next year’s camp right now! Check it out! 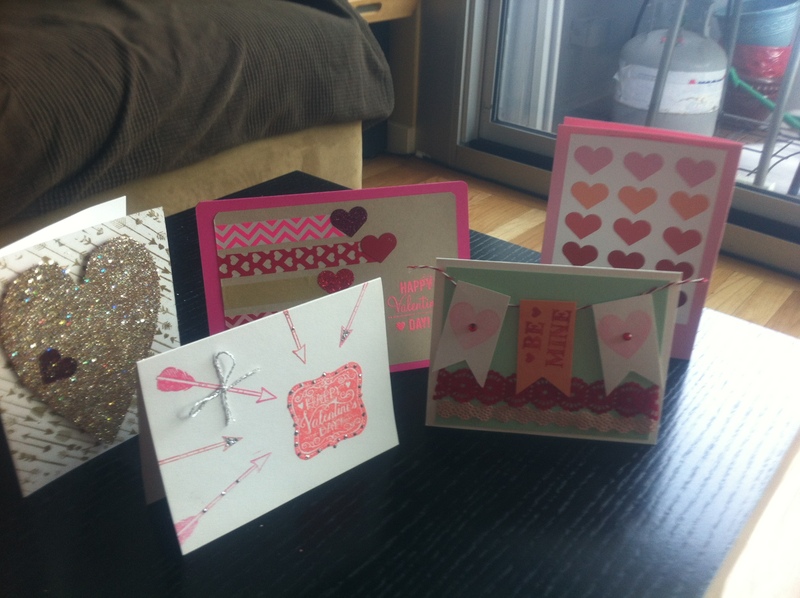 If you’re my friend and read my blog one of these cards might be in your mailbox next month. Last night I went to a cardmaking workshop at Paper-Source where I bought paper scraps for the collage I blogged about a few days ago. All the materials were provided, along with numerous innovative and specialized scrapbooking tools. One of the coolest tools messed around with was called a Xyron. It turned anything you put through it (that was flat) into a sticker. Amazing! We also played with heat emboss glitter and funky shaped punches. I have come to the conclusion that I need some more paper punches. They are extremely versatile. This was the first card I made. It had the best result with the heat emboss. 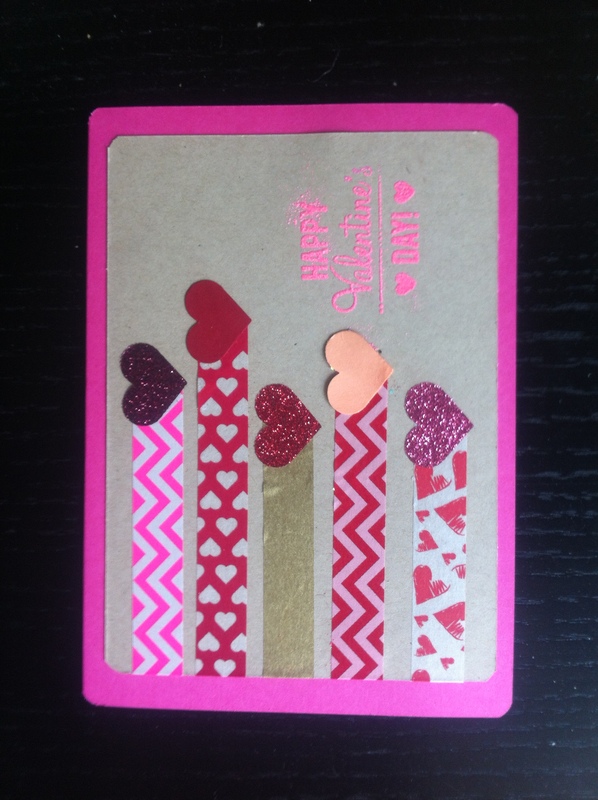 The glitter hearts were punched out of paper that already had an adhesive backing. 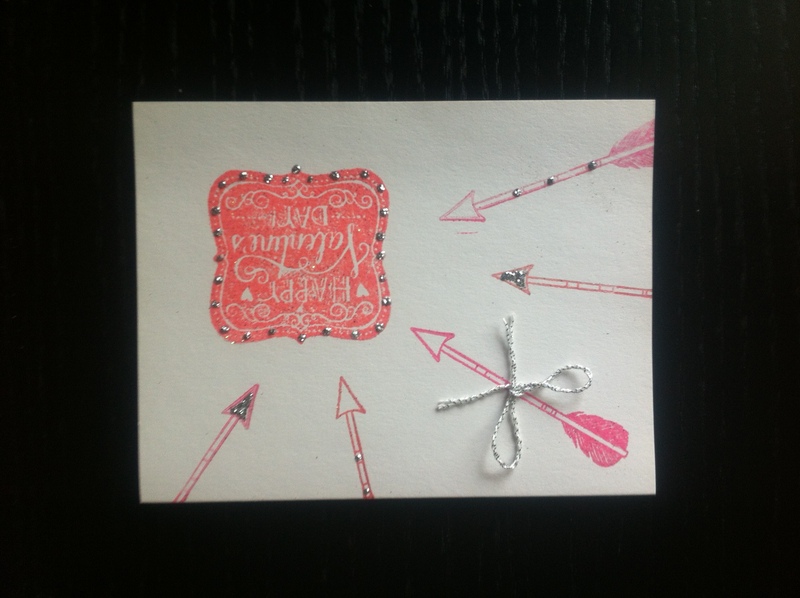 I also used washi tape and a corner punch. 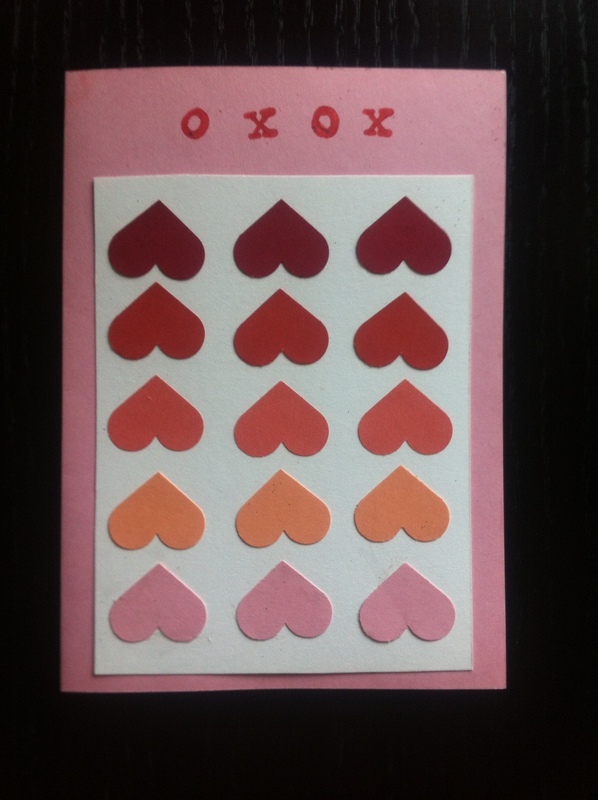 Ombre Hearts were created using the heart shaped punch. 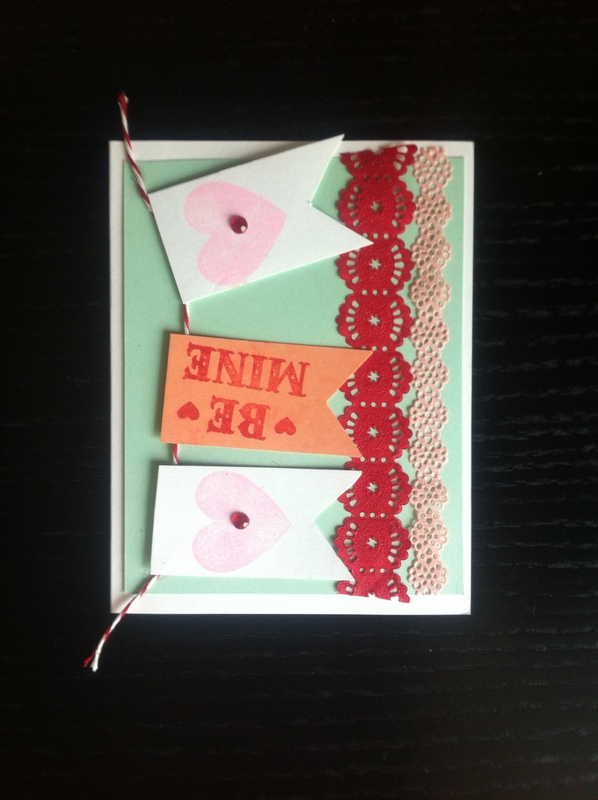 This is my favorite of the cards I made, and it is also the simplest. This was the most complicated card we made. The little banners were super difficult to make, but in the end it turned out well nonetheless. 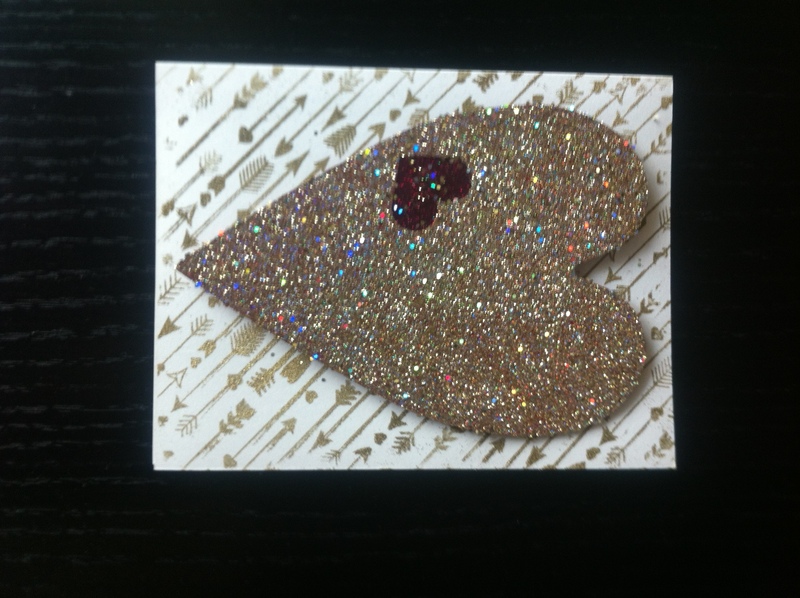 To get the glitter to stick to the heart we turned it into a sticker with the Xyron. So sparkle!! So Sketchbook Saturday and Medium Monday didn’t happen this week. It will happen next week, I promise. Today is supposed to be Terrible Tuesday, were I can share all the things that haven’t worked out as well as I hoped, but I couldn’t bring myself to discuss something so negative. Instead I am going to pretend it is Monday and share my recent discoveries in the world of dyes. For my tea project I did a lot of research on how dye for paint is created. The majority of paint is pigmented with finely ground up minerals. This was an issue in my tea project because creating a powder out of tea wasn’t within my means. However, I did find some interesting links I want to share for those who want to make their own paint the proper way. Pigment: Historical, Chemical, and Artistic Importance of Coloring Agents is a lovely site that breaks down many of the different classical pigments by color and explains their history and use. For example if you click on a pigment such as malachite it brings you to a page that explains the history then the way is made then its chemical properties, and finally how to best utilize it for artistic endeavors. Malachite happens to be oxidized copper and in paint the compound should be coarsely ground to create a richer color. There are over 50 materials covered on the site. Making Natural Dyes From Plants is a fantastic resource for someone who doesn’t have the access to all of the minerals listed on the previous site. It also is great for people who are interested in creating greener products. This site has an extensive list of plants that can be used to dye fabrics, although with some application the materials could be adapted to paint or other mediums. The plants are again sorted by color with a description of the exact shade the flower or plant will create. For those who are less industrious but still want more control over the pigment of their paints you can buy premade pigments. One such store is Iconofile, having a small list of high quality pigments available. Although they aim at an audience specifically interested in icon painting their pigments can be used for any project. The site claims, “They are the same pigments used by icon painters of ancient times, such as Andrei Rublev. Each pigment is also useful for other painting techniques. Whether you are a novice or an experienced painter, you’ll find Rublev dry powder pigments well suited for use in aqueous mediums, such as egg yolk or whole egg (egg tempera), casein, gum Arabic (watercolor), hide glue (distemper) and acrylic polymers” They are also rather affordable, the introductory set of six earth tones costing $16.95.